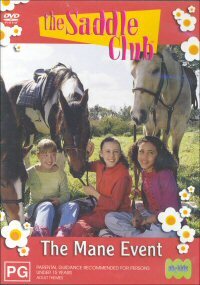 The girls of the Saddle Club are back on DVD in this much loved series. There's lots going on as usual with all the drama you could possibly hope to aim at young girls who love horses or teen drama! This time round we've got a wedding to worry about, missing rings, the whole nine yards! On top of everything else that is happening at Pine Hollow, there is also the mystery of why Red stopped riding some time ago that they need to look into. This disc also shows a maturity starting to develop with the girls as they become interested in boys and all the hassles that go with relationships. It's funny to see the results when the well meaning Veronica decides that she is going to be the one who helps out! Despite all these goings on, there is really nothing to think about with this show, just sit back and everything will be revealed. It's not a bad thing, it's simply a fact. The disc is well presented with not much in the way of faults and certainly none that it's target audience will have any problems with. Audio is in Dolby 2.0 and all sounds and dialogue are clearly audible throughout. Saddle Club is one of those series that you will either love or put aside. For myself as the reviewer I was more or less indifferent, it's bubble gum storytelling that will appeal to about the 10-13 year old female viewer that it's aimed at. My kids liked the horses in it and that's about it. It's worth trying, possibly as a rental first.